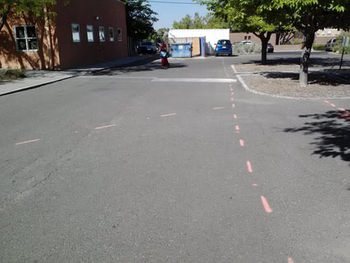 Ground Penetrating Radar Systems of New Mexico recently visited a church parking lot to identify any underground utilities in the area prior to excavation for a new building. Klinger Constructors wanted to ensure that there would be no delays in construction due to severed utilities. The project manager on site was able to scan the proposed building area and identify any dangers in below the surface and map those dangers on the surface of the asphalt with precise depths. This allowed the project to proceed on schedule and without injuries due to damaged utilities. Private utility locating with ground radar is an excellent way to precisely locate anything below the surface because it does not depend on the utility being active. Soil imaging is also used to locate underground storage tanks and coffins because of its ability to “see” many different obstructions in the soil. If you would like to know more about private utility locating in New Mexico, contact your local Project Manager today at sam.baldwin@gp-radar.com or (801) 599-2115. Ground Penetrating Radar Systems of New Mexico can deliver services anywhere in the state of New Mexico such as: Albuquerque, Hobbs, Las Cruces, Alamogordo and Clovis.